My wonderful family threw an adorable shower for me this weekend and my crafty sister made these super cute “Diaper Babies” that were used as decor–I simply had to share them with you! They were lovingly placed in little baskets and around the tables at my baby shower and were such a cute way to recieve a gift of necessity. I also knew I would later smile every time I unrolled one to use for the dreaded 2am diaper change. Yep, these Diaper Babies are for sure the gift that keeps on giving! UPDATE: As of 2018, this post has been viewed a half a million times and I’ve received countless pictures of your own Diaper Babies–please keep them coming! I’ve also included the link below for the full tutorial and all the details on how to make these adorable little diaper babies yourself. I mean…seriously cute;) She used newborn diapers, a baby washcloth for the blanket, and a baby sock for the hat. Want to learn exactly how to make Diaper Babies?? For the instructions check out: Diaper Babies…the Details! This has become one of my most popular posts to date–I’d love for you to share you Diaper Babies with me! We have just a few more things to hang in the nursery and then I will share the details soon. Baby Watch 2012 is still in full effect at our house….any time now….seriously…I am ready! If you’re looking for more creative baby shower inspiration be sure to check out my R2D2 Diaper Cake, The Beatles Baby Shower, Gator Baby Shower, and Dr. Seuss’s One Fish Two Fish Baby Shower (yep…lots of babies around here). Also, while we’re on the subject and you may be pregnant when Halloween rolls around, make your own Pregnant Skeleton Costume and be the talk of the town! How do you make these? A washcloth for the blanket? What is the hat made out of, a sock? Can I getta tutorial?? lol I’m not crafty on my own…I need serious assistance! She should sell them! I’d buy one. Very cute. Here is the how to link. It was above but VERY hard to see/read and easily overlooked. They are too cute! I got the things I needed to make these today. A Friend of a friend just had a little boy. She has 2 little gils at home, I am sure they will think these are adorable!! Thank you for sharing!! Oh my gosh! 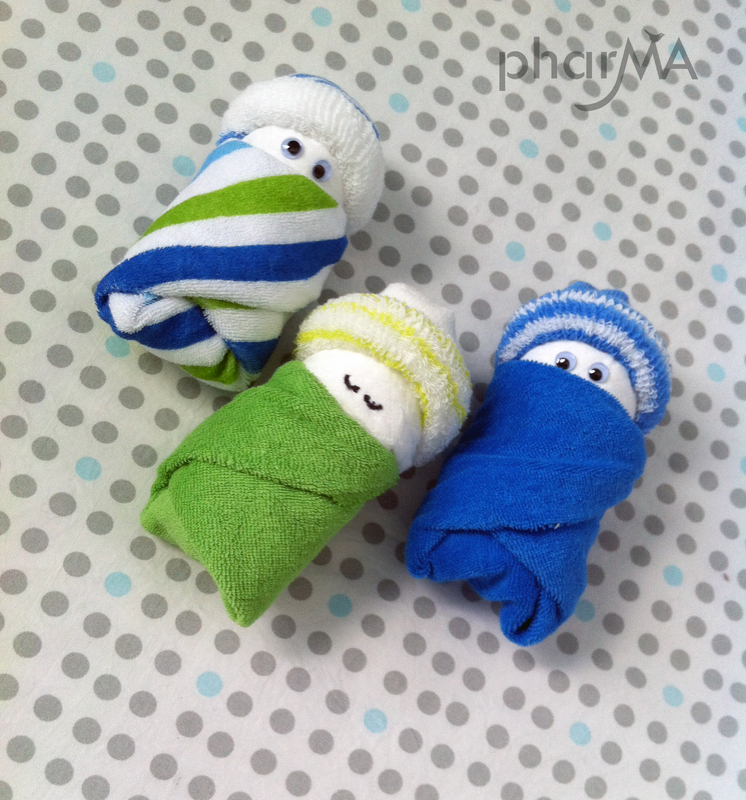 These are ADORABLE!I have a friend that is expecting twins… what a great idea for her shower! !Thank you for sharing! They’re adorable. A word of warning – I wouldn’t do them with larger diapers, as most people these days seem to be buying their own. There’s so many types of diapers, that what you get might not match. The only woman I know who got diapers for her shower used all those ones as burp cloths.Newborn should be safe though – a lot of my friends didn’t bother with newborn diapers, they just used disposables. Less to avoid the laundry that early, and more because the baby outgrows them so quickly, so as long as the baby is small enough, these would be amazing. Where do you get the hats for baby diapers? Please tell me how to make these. They are adorable . I would like to make them for my daughter that is due in May. I made this for my son’s teacher. Everybody loved it. I want to share you the picture of the diaper babies I made. How do I do that? So glad to hear they loved it Vic! I would love to see the pictures…you can email them to me or post them on my Facebook page..can’t wait! Thank you for the idea!! I have a daycare and my little girls loved making one. They are so cute!! So sorry for the delay Rachelle, you’re too sweet…I’ve seen them in baskets, made into wreaths, and even scattered around the tables for party decor :) Hope this helps! These are adorable! I am making about 48 of them for my cousins baby shower and we are using them for a game. As people arrive they will be handed one of these babies and told they can do whatever they want with it…lay it down, hand it to someone or hold onto it. Whoever has the most babies at the end of the shower wins! Much better than buying a bunch of baby dolls and then trying to figure out what to do with them afterwards. This way mommy to be gets some much needed diapers, socks and washcloths! These are so adorable!! I want to make them for my daughter’s shower in November but I’m having a hard time finding the cute little socks like yours. Do you know where your sister got them by any chance? Thanks!! Thank you so much Marlene! She got most of them from Wal-mart and Target :) Congrats on your grand baby!!! !